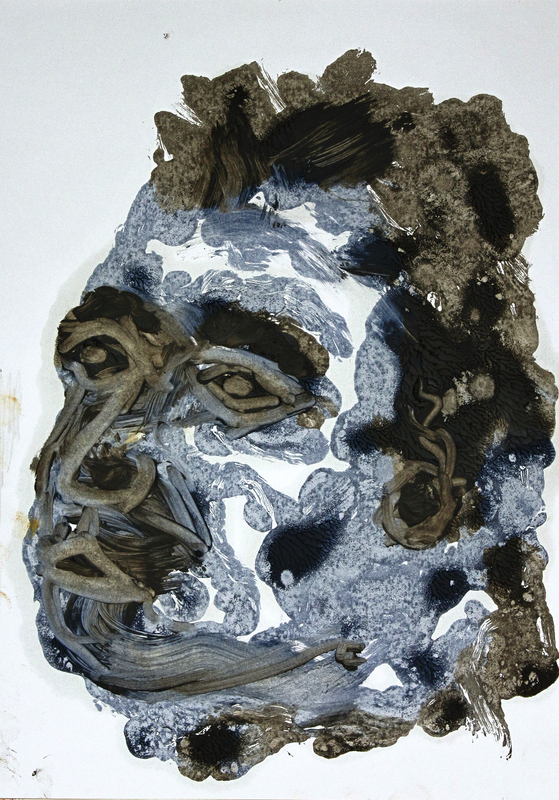 Make five more portrait monotype prints, this time removing different areas of paint with cotton buds, cotton wool, smooth rags, rough rags or tissue paper. 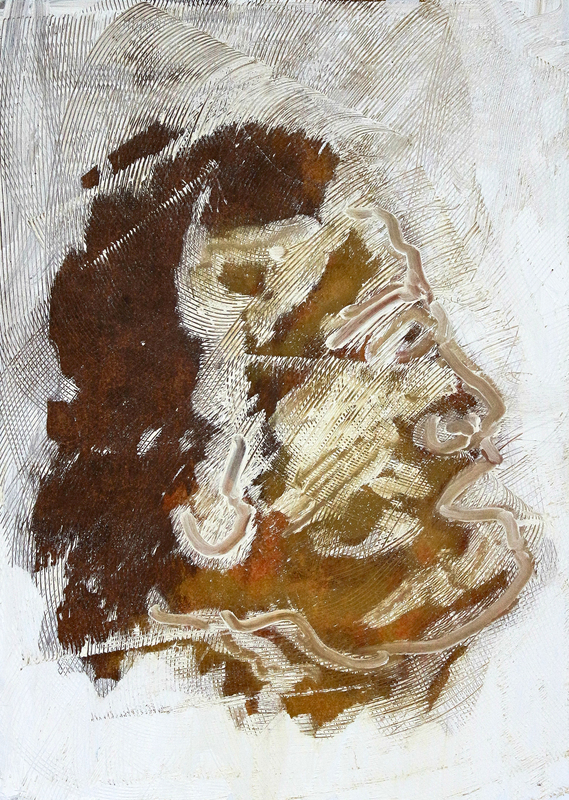 This A4 card print was painted from ink sketch number 10 under a 40x30cm glass plate using burnt umber, burnt sienna, yellow ochre, titanium white and liquin. Various tools were used to scrape off different areas of paint after printing, including: cotton buds, paper towel, sponge and an old comb. The result was pretty messy so I had another go with the same image. Same ink study sketch and same process, but with different ground and slightly messy end result. 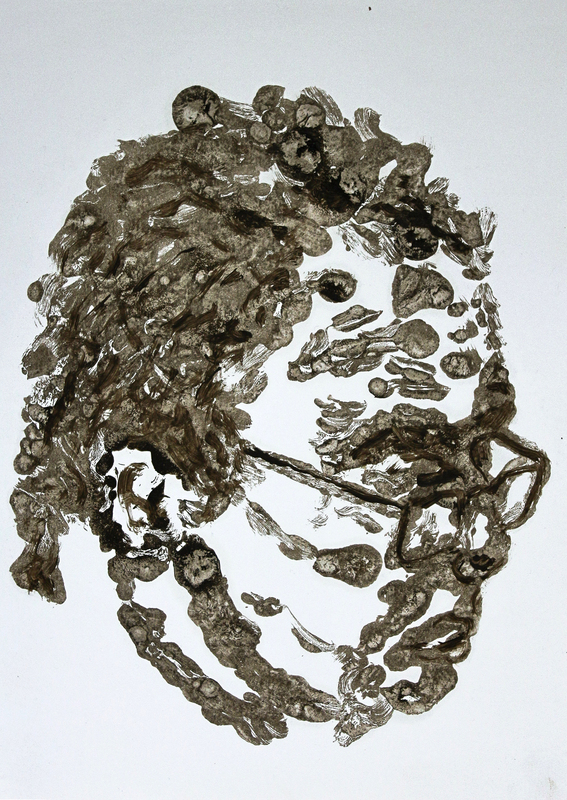 I decided to restrict my final monotype prints to the use of black and whites in different combinations. Again using a 40x30cm glass plate to cover the ink sketch I painted on the glass surface with thinned ivory black and payne’s grey, then removing elements of both paints using cotton buds and thinners on the A4 printed card. 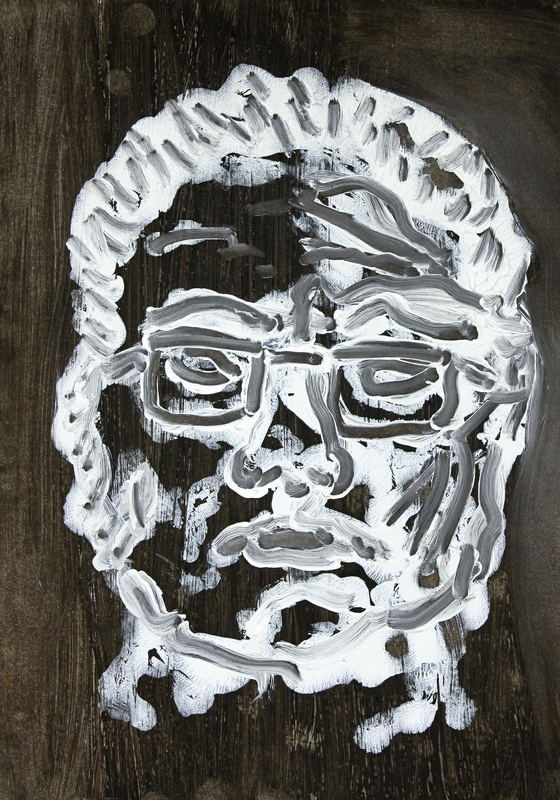 Ivory black and liquin A4 ground pressed onto glass with sketch image painted using titanium white and liquin. Paint was then removed from the printed card using cotton buds and thinners. 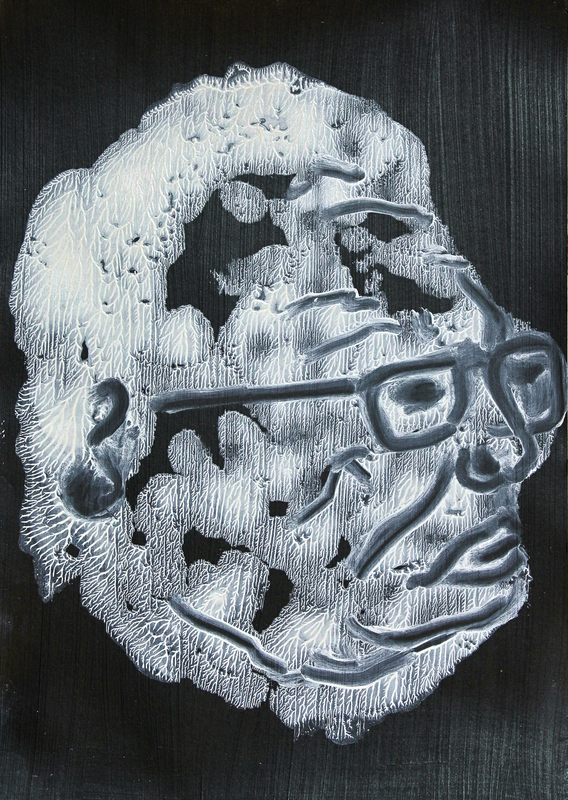 I made a second print of ink sketch 18, this time using white A4 card to press down onto the painted glass image – this time using ivory black and liquin to capture the image. Cotton buds and thinners were again used to scrape off elements of the card’s painted surface. I’m particularly intrigued by the silhouette effect caused by the liquin seeping out from the paint onto the white card. Black gesso covered A4 card pressed onto image painted with titanium white and liquin. Paint removed from printed card with cotton buds. This last print is my favourite (leave best till last?) 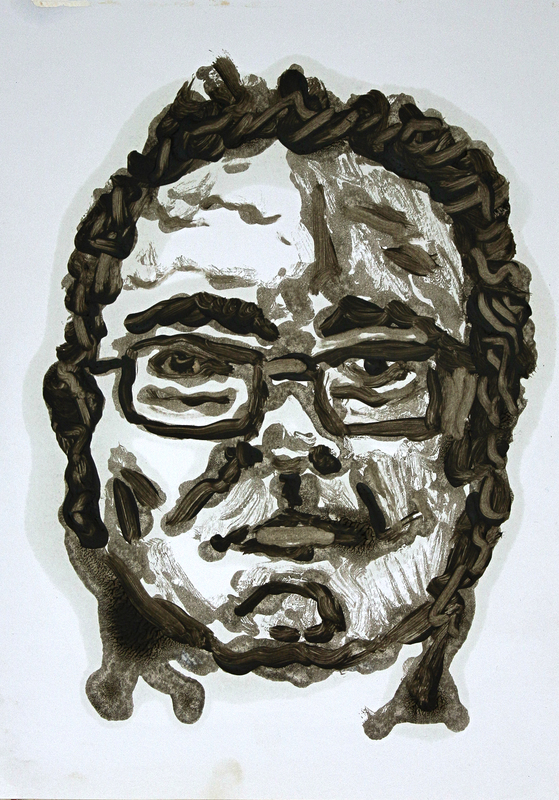 I think my technique improved with each attempt and this image, in a fashion, captures my reflection on the monotype print process as I developed. 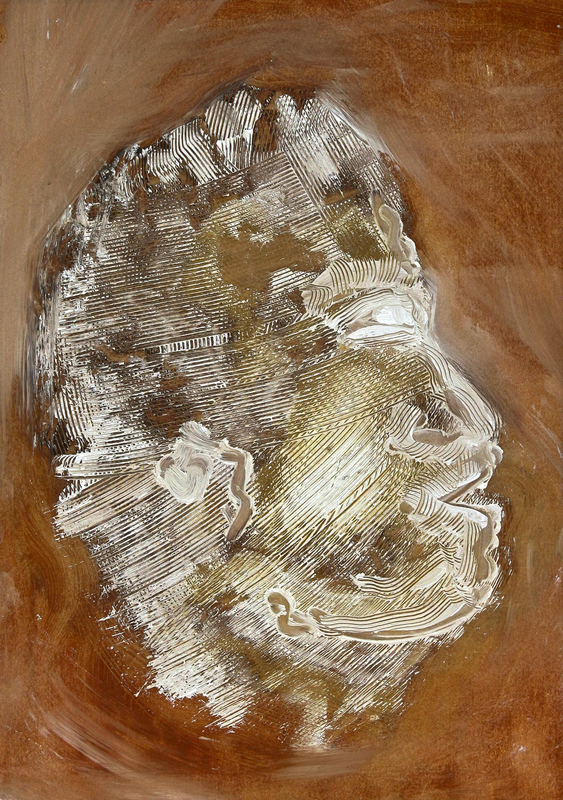 This time I painted my self portrait on the glass plate using ivory black and liquin mixture, pressing down white A4 card and then removing different areas of paint from the printed card with cotton buds and sponge.